Why don’t you make a “Dressed Chinese yam and dried seaweed”? The crunchy texture of Chinese yam is good with dried seaweed and wasabi. Chinese yam is so healthy and full of vitamins and minerals. Peel a skin of Chinese yam. Cut them into rectangles so that you can eat them easily. Slice okras to shape stars. Add water to dashi soy sauce. 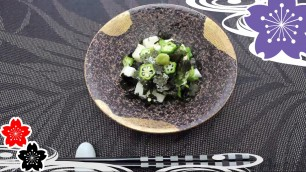 Dissolve wasabi in the soup and mix with okra. Dish up and sprinkle crushed dried seaweed. ✍In Japan people like ropey foods like Chinese yam, okra, or natto, as healthy foods. People sometimes eat them as a combination of several ropey foods. The dried seaweed has another texture. So you can enjoy the characteristic flavor of Japanese foods.